I bought the Aune to replace my previous dac, a Muse DAC with 4 parallel Phillips TDA1543 chips. I don't really understand the theory behind parallel non-oversampling DACs, but the Muse did sound very good. 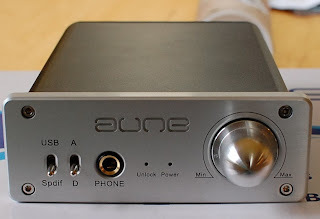 The Aune sounded better though with better bass response. It was also much more attractive and well built. The headphone amplifier was a nice bonus, but I rarely used it. The power supply ran hot, and eventually the plastic of the power supply cracked from the heat and fell apart. Still, I'd have no trouble recommending the Aune. I sold mine as I found the built in dac of the Pure i-20 sounded just as good.